Binary compounds are those that contain two different elements.Ternary compounds, we will discussed in the next article, contain three diferent elements. Within each of these two groups there are various categories of compounds that have different naming rules. Figures 2 outlines the general classes of inorganic compounds. When naming a compound, first identify what class of compound is being named. 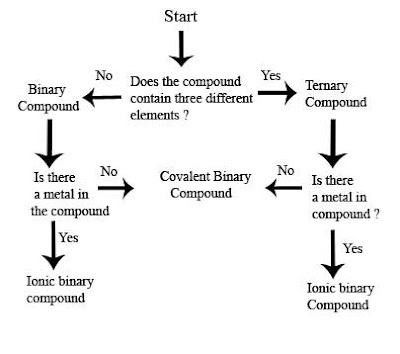 Using the flowchart in figure 2.1 below to decide if the compound is binary or ternary. Then decided if the compound is ionic or covalent. Ionic compounds are those that contain a metal and a nonmetal or a metal and a polyatomic ion bonded together. Covalent compounds are those that have two nonmetals bonded together or a nonmetal bonded to a polyatomic ion. Before looking at representative ionic substances, let us see how simple ionic compounds are named. 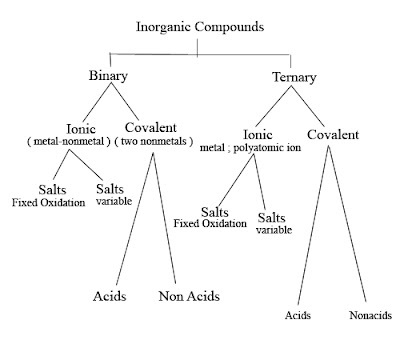 We shall start with binary ionic compounds, those that contain two different elements. First name the metal, and then write the nonmetal, replacing its ending with ide. 2. Write the name of the nonmetal, replacing its ending with the ending ide. How is NaCl named ? Notice that Na is an alkali metal , and Cl is a halogen, a non metal. First , write the name of the metal sodium, and then write the name of the non metal, with an ide ending; chloride - ine + ide = chloride. NaCl's name, therefore, is sodium chloride. Okay, Thats all about Naming Binary Ionic Compound. Now, we will naming Binary Compounds Containing Metals With Variable Oxidation Numbers. What if the metal ion component of a binary ionic substance has a variable oxidation state ? We mentioned that metals can exist in more than one oxidation state;consequently , more than one binary compound can result when such a metal combines with a nonmetal. For example, two chlorides of copper are known, CuCl and CuCl2. Our naming system must provide a means for distinguishing between the two. In the stock system , we modify the above rules for naming ionic substances to include the oxidation state of the metal ion. To write the complete names of CuCl and CuCl2, it is only necessary to append the modified name of the nonmetal ( nonmetal-ending + ide ), chloride. Therefore, CuCl is copper(I) chloride, and CuCl2 is copper (II) chloride , Note that a space is placed between the right parenthesis and the nonmetal name, but no space is written between the left parenthesis and the end of the metal name. When reading names expressed this way, state the metal name followed by the number - copper one and copper two. In the old system, the names of the chlorides of Cu are cuprous chloride , CuCl, and cupric chloride , CuCl2. Naming binary compounds using the stock system only requires knowledge of the oxidation state of the elements in the compund. Additional knowledge of the old names for metals is required when using the old system. Look on this table below to know the oxidation number from the metal . 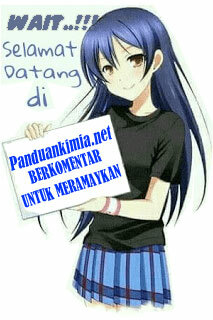 a. HgI2 . determine the oxidation state of Hg in HgI2, using the rules for assigning oxidation numbers. Iodine is a halogen with an oxidation number of -1 in binary compounds; two I's have a total of -2. Consequently, Hg's oxidation number is +2 ( the higher oxidation state of Hg ), which is mercury(II) in the new system and mercuric in the old system, Iodine's name is changed by removing the ine and adding ide. b. PbO2, the total oxidation number for two oxygens is -4. In order to add up to zero, Pb's oxidation state is +4. The +4 oxidation state of lead is the higher one, necesitating that ic is placed at the end of its old name, plumbum. d. FeO . Oxygen's oxidation number is -2; therefore the oxidation number for iron is +2-iron(II) or ferrous. Okay, thats about naming binary ionic compound, The Next article we will discuss about Naming Binary Acid, Covalent compound , and Base. 0 Response to "Naming And Writing Formulas For Binary Ionic Compunds "